This Wrist Band and Coiled Cord set feature 360 degree conductive contact around the wrist to provide maximum skin contact. 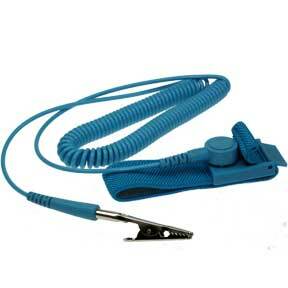 Adjustable elastic band with conductive plated threads. Polyurethane Polymer allows the strain relieves to survive 1 million flexes. The Banana jack prevents cord tangles. Alligator clip is included. Foot grounders provides a continuous ground path between the operator and a properly grounded ESD protected flooring. Foot grounders are designed for use in applications where user mobility is required; such as wave solder; kitting; and quality control. Foot grounders quickly and effectively drain the static charges which collect on personnel during normal; everyday activities. Anti static devices are employed to reduce, dampen, or inhibit the buildup of static electricity to eliminate the risk of any damage being caused by it. At SF Cable, you can find various anti static devices and order them with a few clicks.